I would like to be Steven. He is pretty elite trainer, has strong pokémon.And he is even nice person.That would be life!!! !By the way...Does anybody know how old is he? I would like to be a Pokemon trainer just like Ash. The guy from the Spinda episode. "Pokemon Advernturer" sounds awesome searching for rare Pokemon. Plus he got a purdy g/f. 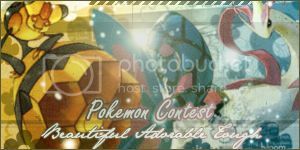 Thanks to xxpoke_loverxx for the banner. Just like Ash but not as stupid. i.e. like letting people borrow my pokemon(squirtle,charizard,pidgeot). Gary, cause he's just cool. Anyways, I would be Sabrina or Lucy. I heart them both so I couldn't pick one over the other. Don't give me all that "they are overrated" crap either, cause I fail to see how they are. I like them and that's all that matters. I would most like to be like Misty because she's got water pokemon and i love water types. After Tyrogue though. Plus i like Ash and fancies him badly. Uh, either Ash or May. Ash ebcause he is strong and a great battler. And May because she is a great coordinator. youssef20138 1000 Years of Pain! WILL THIS ACCOUNT NEVER GET DELETED??? ~Shadow Espeon~ I did it!! Girl(If I was a girl): Lucy. She is cool and has cool pokemon. Milotic and Seviper ftw. I would either be Gary or Harrison, most probabily Gary. Both really good trainers.